I love the Wayback Machine but it has some bizarre and crippling flaws which make it incapable of preserving the web’s content. In fact, the last 5 or 6 times I went to recover old content via the Wayback Machine, the Internet Archive had lost all of the content that it had already saved at one point. This can happen 2 ways. 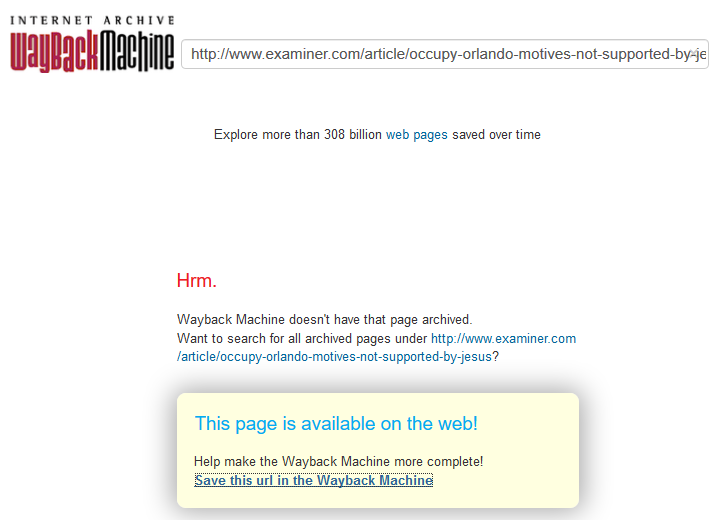 I already wrote about one of them: Wayback Machine Error: Page cannot be displayed due to robots.txt. The other way is when a website is 301 Redirected. This is an example of some old, deleted Examiner.com content. So in this case, I went ahead and clicked on “Save this URL in the Wayback Machine” even though the URL was NOT on the web. I just wanted to see what would happen. And what happened is exactly what happens any time a site is 301 redirected. 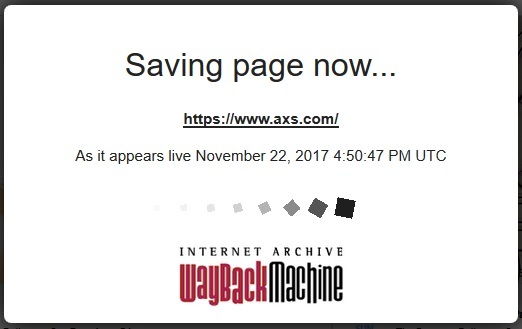 Wayback changed the URL to AXS.com. I looked and was unable to find anyone at the Internet Archive to reach out to. I’d like to make them aware of this problem. It must be a mistake! Isn’t the entire point of the Internet Archive to … you know … archive the Internet? Did you lose content from the Wayback Machine? It happens over and over with everything from small sites to larger publishers which go away. In 2016 Examiner.com shut down and in more recent history, the Internet lost LAist.com, SFist.com and DCist.com. Hundreds of thousands of pages which the Internet Archive DID have saved are coming up missing all the time due to this “flaw”. I can’t imagine it was designed to work this way. If you lost your content or know a solution to this problem please comment below. I have hundreds of people who will thank you for it who reached out to me when Examiner.com closed. Unless your actual point was that the Wayback Machine used to have the article saved but the archived version was gone when you looked for it later. That would be a genuine anomaly. Which unfortunately seems to happen, albeit uncommonly.